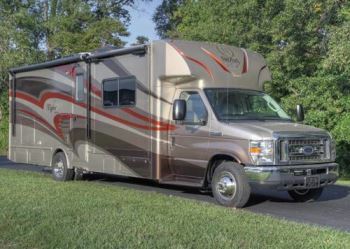 The B+ Viper is one of two NeXus models constructed on the Ford E-450 chassis. Factory-direct sales and customer-focused quality are two guiding principles of this motorhome manufacturer. Sometimes a different approach needs to be taken. NeXus RV has embraced this philosophy and individualized its strategy. NeXus builds Type C Phantom and B+ Viper motorhomes in lengths ranging from 23 feet to 32 feet, plus the recently introduced NeXus Ghost Super C diesel motorhome in 34-foot and 36-foot lengths. The number of satisfied NeXus customers is growing. But what really makes NeXus RV stand out is that the company sells directly to the customer rather than through a dealer network. NeXus was established in 2010 by Claude Donati and Dave Middleton, RV industry veterans and lifelong friends. They adopted the factory-direct concept from the start with a commitment to building and selling motorhomes on the same campus. Today the NeXus manufacturing facility in Elkhart, Indiana, encompasses 86,000 square feet and is accompanied by a 25,000-square-foot showroom. With the recent trend toward Internet shopping, more and more traditional storefront businesses are finding it hard to compete with online sellers. Even some large box stores that feature discount pricing are struggling. However, NeXus is anything but a discount, no-frills operation. In fact, the NeXus buying experience is much closer to a high-end yacht purchase. The company concentrates on building upscale units, and much of the savings associated with factory-direct sales goes into more advanced construction design and quality. Savings are passed on to the consumer as well. When visiting the NeXus facility, prospective buyers receive a thorough introduction to the company. This includes a complete factory tour to view the various construction techniques that are employed. The owners’ offices are connected to the showroom display area, which enables customers to communicate directly with Claude and Dave about their specific needs and preferences. From there, one of the basic floor plans can be selected and the customization process begins. Each NeXus RV can be tailored as the client wishes. Any particular fabric, décor, or exterior paint scheme can be selected. Modifications to furniture, cabinetry, appliances, and more are possible “” down to the placement of electrical outlets. And the personal attention doesn’t end after the customer places an order. NeXus offers a fly-drive program: they will fly in the customer, reimburse their airfare, and let them drive off in their new motorhome. Buyers are encouraged to spend at least a day parked in one of the company’s full-hookup sites, where they can become familiar with their new motorhome and test its systems. Any adjustments can be taken care of immediately. Customers who are unable to visit the Elkhart facility can view product videos on the company Web site and have any questions answered by Dave, Claude, or other factory personnel. Customers can opt to have their new NeXus motorhome delivered to them and receive an extensive walk-around to learn about its many features. NeXus accepts motorhomes and towable RVs as trade-ins. But before they are placed in the company’s stable of certified preowned units for sale, they must pass a 100-point factory-performed inspection. Preowned units are examined and tested on the same production lines where NeXus motorhomes are built. For customer convenience on the road, NeXus has established a large network of service centers across the United States to handle any warranty issues that may occur. The phone numbers of the company owners are also available for after-hours or emergency contact to ensure that every customer is well taken care of after the sale. NeXus steps above many of the typical construction methods used in the manufacture of B+, C, and Super C motorhomes. A Ford E-450 chassis is the base for the company’s Type B+ Viper and Type C Phantom models; the Super C Ghost is built on the Navistar International TerraStar commercial truck chassis. For each model NeXus adds a steel truss system to the frame rails to support the motorhome floor. This creates a solid foundation and helps to transmit the load more evenly across the frame rails. The walls and roof utilize steel-cage framing rather than aluminum for added strength. This also provides for a more rigid, squeak-free motorhome because of minimal flex and increases safety for its occupants. The sidewalls and roof are fiberglass, but no wood products are used as backers. Wood such as lauan can absorb moisture and expand and contract, which may cause hairline cracks in the fiberglass over time. Instead, NeXus uses an Azdel substrate. This eliminates expansion, prevents mold from forming, and provides an improved R insulation value. The seamless fiberglass sidewalls and fiberglass roof, plus molded front and end caps, reduce the possibility of leaks from water intrusion. NeXus has put a lot of effort into making these RVs suitable for cold-weather operation. All of the plumbing is located above the floor. The fresh water and holding tanks are installed beneath the floor, but they are placed into a steel tub, which shields them from the outside elements. Flexible ducting from the furnace is fed to this tub to keep the tank warm and prevent freezing. In fact, all of the basement storage bays are built with steel for improved strength. Foam board insulation is added to the roof, and fiberglass batten insulation is used in the caps and transition areas to help with climate control inside the motorhome. Ducts are cut into the roof insulation to feed the air-conditioning louvers. The company’s attention to detail and quality construction become evident when one is touring the facility. No shortcuts are taken, and the emphasis is on building a better RV, not cutting corners to pinch pennies. The factory is also one of the cleanest you’ll see, and everything is neatly arranged to create an efficient work area. I inspected a number of motorhomes in various levels of construction, and each one exhibited a number of well-thought-out ideas. Plus, quality components were used in every area of construction. The end result is a motorhome that drives and handles very well with a smooth and quiet ride. In fact, a trip to www.nexusrv.com will reveal many testimonials from just a portion of satisfied NeXus owners. The blend of quality, personal attention, and price savings results in a powerful reason to consider NeXus RV. NeXus RV, 3400 Reedy Drive, Elkhart, IN 46514; (855) 786-3987; www.nexusrv.com.